However much they lie, they can't change what I know. Fireball was Tyler's debut novel, published by Parthian Books in 2010 as part of their Bright Young Things series, which also included work from Wil Gritten, JP Smythe, and Susie Wild. Fireball went on to be longlisted for Wales Book of the Year, shortlisted for the Guardian's Not the Booker Prize, and received the Media Wales People's Prize 2011. The first edition sold out and Parthian subsequently released a second edition, which includes an interview with the author and a short story extract. The second edition is available for sale directly from Parthian, or through your local bookstore (ISBN 1908069783). It is also available on Amazon. Fireball pushes beyond the bounds of its genre, capturing the dynamics of friendship, seduction, and loss to impressive effect. Razor's slang-heavy yet emotionally grounded narrative provides an effective bridge between the reader and the boys' final summer together, confirming Keevil's flair for evoking empathy with the extreme in this breathlessly readable and confident debut. This is a truly accomplished novel: funny, gripping and touching in turns, with a conclusion that continues to resonate long after the book is over. Keevil's skill as an author is everywhere evident: in the quirky dialogue, the lucid prose, and the skillful interweaving of multiple and non-linear narrative strands. This is clearly a novelist to be reckoned with. Keevil offers up the information on the first page - all part of a fragmented narrative technique that circles and worries around the events of that summer...effectively rendering Razor's troubled, obsessive state of mind and the gradual process by which he attempts to make sense of the death of his friend. There's also a real sense of loneliness and loss behind this story, and the insecure, virginal Razor speaks to the troubled teenager in all of us. The author stretches time and builds his story in layers, achieving a sort of restrained tension. It’s absorbing, moving, tragic and sometimes funny. Fireball, one of four novels that heralds Parthian’s new Bright New Things series, is a brilliant and memorable first novel from a writer who grew up in Vancouver and now lives in Mid Wales. 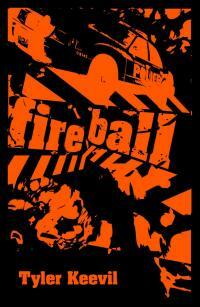 Sylishly written and immensely readable, Fireball gives notice of an impressive new talent. Tyler Keevil is a name to watch out for. This book deserves to be a cult hit. Chris will stay with me for a long time.